Today we welcome S.M. 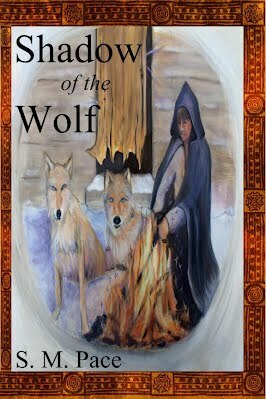 Pace, author of Shadow of the Wolf, to Comfortably Read! Tell us, what is your writing process like? I’m a rather bizarre mix of panster and overplanner. In the past I’ve spent weeks creating an outline, then several months to a year not following that outline. Lately, I’ve settled into a new and more organized process that keeps me a lot more productive. Step 1: Planning. I’m a huge fan of Holly Lisle, and I use her How To Think Sideways course, as well as her plot and scene clinics to plan out my novel. It’s helped me create scene ideas that are actually good, plot moving scenes, so I won’t end up discarding my outline, and wasting a lot of time meandering around three or four disconnected main plotlines. my Write or Die application to force myself to produce the words I need. I don’t like doing it too much, because the words I produce, while chock full of muse inspired strokes of brilliance, are an utter mess. They need to be revised before I can add them to the draft. though with a bit more determination if I have a place to submit them. Step 3: Revision. Once I finish a first draft, I let the work breathe anywhere from a week to month, depending on how badly I want to start working on it again. I use Holly Lisle’s revision course for this part. It helps keep me organized and on track, so I don’t waste time doing line edits on a scene I later find out needs to be cut out completely. Once I’ve produced a revised second draft, I go to my online critique groups. My favorite one is critters.org. I’ve gotten my most useful reviews from there, as well as made some awesome writing friends. Once I have all my critiques, which can take up to two months for a novel, I compile everything and start making notes. Then I go back to cutting, rewriting and revising. I submit it for more critiques, and back again to cutting, rewriting and revising. My sixth draft is usually my final draft. I polish it as much as I’m able, submit it to my editor for a final proofread. Thanks for stopping by, Stephanie! !